I have to admit that what I am going to share with you today isn't going to be the most embarrassing moment of my life, it will be one of them, but the worst is so bad that I really don't want to share it. Surely we all have a few moments in our lives like that? At the end of every school year we would have a big assembly for the whole school where awards were handed out. I usually had some kind of award coming, whether it was perfect attendance or something more academic. As this was one of the last years I was in school we were sat at the back of the hall, with over 1000 other pupils in front of us. I can't remember what the award was for the year that this happened, but I know that there were only 2 handed out in each year; 1 to a girl and 1 to a boy. As the younger names were called out I got myself ready and straightened my tie. As the Head Teacher called my name out I took a deep breath and stood up, almost tripping over the person sat next to me, thankfully I didn't and carried on walking down the aisle. The awards were to be presented on the stage, so I took my first step up the stairs, and this is where the problem started. I caught my foot slightly in a cable, I'm not sure if it was a light or a microphone cable, but it made one heck of a noise. As I got my foot out of the cable, my other foot stepped up and I went flying! I landed on the steps on one knee with my arse in the air. Seeing as we had to be in full uniform for the ceremony I had a skirt on so was scared that I'd flashed my knickers to the entire school. As you can image people laughed, a lot. I was so embarrassed I didn't know what to do, so I jumped up and carried on as if nothing had happened. I collected my award and sat back in my seat, where everyone around me was poking me, laughing and making jokes. I tried my best not to laugh but I couldn't help it, I was in hysterics. One of my teachers had to ask us all to be quiet. No-one has ever told me that my skirt went up, so I assume my knickers weren't on display, but doing that in front of over 1000 people was pretty embarrassing. 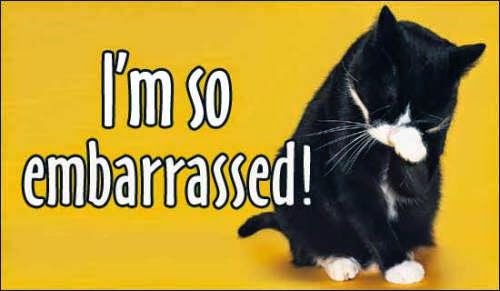 What was your most embarrassing moment, or do you prefer to keep it to yourself?